Our cabin is located on Neal's Pond in the heart of the Green Mountains. Come enjoy your Vermont vacation where you can watch the ducks, loons, and geese paddle by and see the occasional moose feeding out front. It is fully furnished with kitchen, dining room, bathroom, and living room, TV/Satellite with DVR and DVD player, high speed wireless internet, with all the amenities of home including front loading washer and dryer. Located on a 3/4 acre lot with a large private yard great for family game of volleyball or have a camp fire in the firepit. There are neighbors on one side of the cabin we are the last house on the road so there is no traffic . Great location for outdoor actives including hiking, boating, and fishing. Nearest airport: Mancaster Airport at 142 Miles. Travel from only 20 to 60 minutes to get to Six Gun City, Santa's Village, Mt Washington Cog Railway, Golf Courses, Burke Mountain , Cannon Mountain, Bretton Woods ski area, Maple Grove Museum, Fairbanks Museum and Planetarium, art Galleries and ample antiquing sites; Just 60 minutes to Canada. These rates are for up to 7 people. If you are looking to have more guests please contact the owner. The 'Bull Rush Inn' has always had a very special place in my heart and I hope that if you choose to spend your vacation here that you will love it as much as I do. This spot on the lake has been in my family for many years. My father's family owned the land and used it to pasture thier farm animals. My mother's grandparents bought this lot and put a camper on it. During thier stays my great grandmother noticed all the moose that would come feed at the waters edge, so she started calling it 'Bull Rush Inn'. My Parnets bought the land from my great grandparents and built the cabin here in 1991, when I was just 10 years old. I've been in love with it ever since and I'm very glad to be able to share it with you. My husband and I have done a lot of work here over the years. We had turned it into two units in 2006, but in the fall of 2012 we've converted it back into a single family home. We upgraded the kitchen and made a large master bedroom with its own private deck. Wouldn't hesitate to visit again. The place exceeded our expectations. We've been living in Arizona for 6 years and wanted to celebrate my wife's 70th birthday with family from Connecticut. The accommodations were excellent. A few of us enjoyed the boat ride. The fall foliage was superb. Enjoyed the camp fire on our last night. We loved our stay at this beautiful lake house. The views were gorgeous and the relaxed feel was exactly what we were looking for. House had plenty of space for us and accommodated all of our needs. We took the boat and kayaks out and had fun days fishing. Had a few rainy days and wish we could of used the fire pit more. We look forward to visiting again sometime soon. Beautiful house and yard. Enjoyed the deck/patio during the day and the fire pit at night! We were quite pleased with the accommodations at Bull Rush Inn. My dog loved the yard, and of course we all loved the lake/pond. There were many options for sitting and drinking your coffee, or just relaxing. Whether you wanted to be in the sun or the shade. I enjoyed hanging with the visiting ducks each day, plus seeing the loons and herons (no moose :-( ). We drove down to The Frost Place in Franconia, NH which was beautiful with its view of the White Mountains and a lovely Poetry Trail walk through the woods. The only unfortunate part of our stay was that they were building a house directly next door - which is not what you want on your quiet, relaxing Vermont vacation. Luckily they were usually only there a few hours some days - and not every day. Overall though we thoroughly enjoyed our stay. 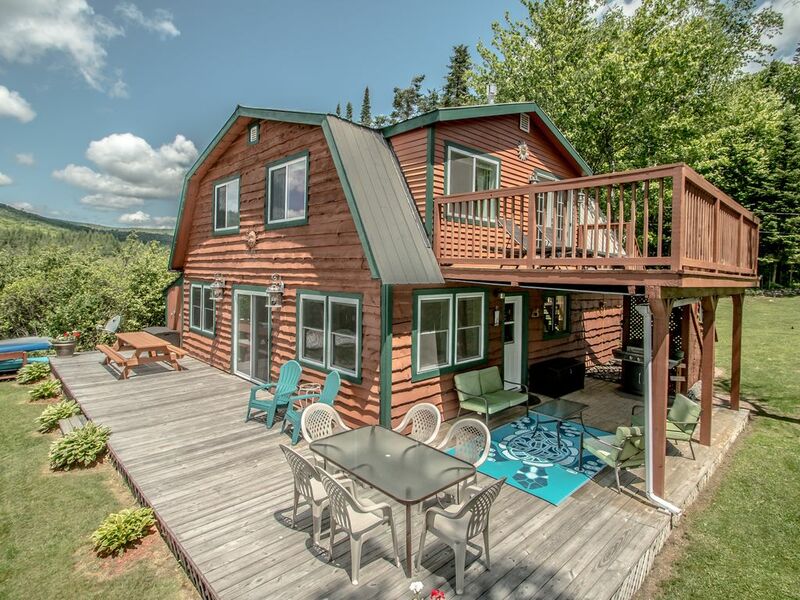 This fabulous fully-equipped home features a quiet lakeside setting and gorgeous property! This lovely home was such a wonderful place to stay. Beautiful touches were evident throughout, starting with the bottle of wine that greeted us upon our arrival...so thoughtful! Beds were comfy, rooms were spacious and clean, and lake views could be enjoyed from almost every space. The kayaks gave us options to enjoy the lake even more, while my sons used the rowboat to catch smallmouth bass, perch and sunnies. The fire pit had chairs already set up so we enjoyed a crackling fire every night under millions of stars. Absolutely a joy to visit and we hope to return next summer! Very relaxing and fun week!!! We loved it! Fishing, relaxing, swimming at the sand bar, kayaking and star gazing. The most relaxing week with kids we could have asked for. Cancellation Policy: 100% refund before 30 days of your arrival date. No refund within 30 days of your arrival date, unless we can re-book your stay. Pet Policy: Most pets are welcome, but only with prior approval from the owner. You must clean up after your pet (scoop the poop and clean up dog hair). We prefer if your pet stays off the furniture and beds. $175.00 pet fee will be charged.